Is your Switchgear Safe, Smart, Servicable, & Simple to use? APT Microgrids focus on creating the energy systems of tomorrow; energy systems that are smart, energy efficient, sustainable, and reliable. An APT Microgrid is a self-sustained local energy grid with expansive control capability. APT Microgrids have the ability to operate autonomously as well as connect to and disconnect from the utility power grid, in parallel with the normal source utility grid or isolated from the grid. Let APT be your source for alternative renewable energy Balance of System (BOS) equipment for Solar Farm Power Systems & Photovoltaic (PV) Power Plants. APT has the resources and expertise to provide safe, reliable, and cost-effective solutions for the collection of solar generated power for utility scale grid tie and microgrid applications. APT EnerStore Battery Energy Storage System (BESS) provides state-of-the-art grid/microgrid stabilization for renewable generated power, including solar, wind, etc. APT BESS can be stand alone NEMA 1, outdoor NEMA 3R, or fully integrated with low voltage switchboards, transformers, and medium voltage switchgear all in a single Outdoor Walk-In ISO Container Based Solar Power Combination Module. APT Automatic Paralleling Switchgear can be designed to operate at either medium or low voltage and is used in applications which requires operation of multiple generators in parallel only, generators in parallel with a utility source, or multiple utility sources in parallel. This allows for the bumpless transfer of electrical loads via automatic standby operation. APT Medium Voltage (2.4kV, 4.16kV, 7.2kV, 12.47kV, 13.2kV, 13.8kV, 14.4kV, 15kV) metal enclosed Automatic Paralleling Switchgear can be built for both indoor (NEMA 1) and outdoor (NEMA 3R) installations. Available in both full and compact sizes, and featuring vacuum circuit breakers, it offers flexible options to meet virtually any power system needs. The APT Automatic Transfer Switchgear (ATS) is used to switch power from a normal source to an emergency source. From Open Transition Transfer to 100ms Closed Transition Transfer and soft loading/unloading options , APT Automatic Transfer Switchgear will allow facilities to switch between normal and emergency power seamlessly. APT is one of few leading manufacturers that produces switchgear, equipment buildings, and software controlled automation systems to form an integrated walk-in switchgear power system in either an insulated equipment building or an ISO container based switchgear building for easy shipping and rapid deployment power systems. APT Low Voltage (208V, 480V, 575V, 600V, 690V) Switchgear can be used in Prime Power or an Emergency Power applications which requires operation of multiple generators in parallel. APT Switchgear offers seamless transfer of electrical loads from the utility to the generators and vice versa in conjunction with automatic standby operation. APT Generator Quick Connect Switchboard or Tap Box is your best solution for a quick way to connect a rental generator set or load bank to your facility. APT offers floor-standing or wall-mount designs, ranging from 400A to 4000A, and optional features including circuit breakers, phase rotation monitoring, ground fault monitoring, and various enclosure options. APT RotoVerter Motor-Generator Systems can be utilized in various applications such as frequency and voltage converters, rotary UPS, grid isolation and grid support devices, micro grids, and solving power quality problems. APT RotoVerter offers complete galvanic (electrical) isolation. 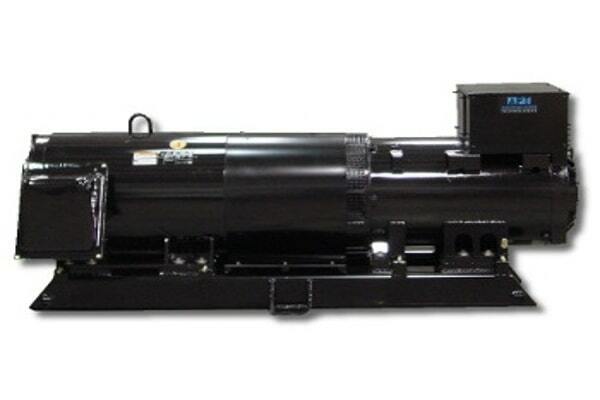 This prevents the most extreme over-voltages and surges from damaging loads connected to the generator side of the system.